TURIN -- Sergio Craveros promotion to CEO of Alfa Romeo is part of a broader restructuring of Fiat Group Automobiles. Fiat has created four new cross-brand functions to strengthen synergies within the companys three brands: Fiat, Alfa Romeo and Lancia. Cravero, 48, gets one of those cross-brand functions. The Turin native will be responsible for coordinating product development of individual models and for determining product initiatives for the three automakers. Fiat group CEO Sergio Marchionne said the automotive sector is experiencing changes that require Fiat to adapt its organizational structure rapidly. Marchionne said the reorganization is an important step in helping the Italian conglomerate face future market challenges. Cravero joined Fiat in 1986. Since then he has held various, successively more senior positions in the technical, commercial and marketing areas. Cravero has been Alfas head of marketing since 2005. The mechanical engineer fills one of the three jobs left vacant following resignation of Luca De Meo. Harald J. Wester replaces De Meo as CEO at Fiat sporty sub-brand Abarth. Wester also remains Fiat group chief technical officer and Maserati CEO. 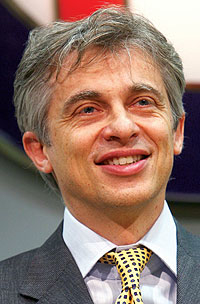 On January 12, De Meo quit as Fiat groups chief marketing officer as well as CEO of the Alfa Romeo and Abarth brands. Industry sources say he is moving to Volkswagen group to take a top marketing position. De Meos chief marketing role at Fiat is unlikely to be filled.